Google occasionally displays information boxes with snippets of information pulled from other websites. Among the more common information boxes is a dictionary definition. Google's hidden dictionary is pulled from multiple internet dictionaries, and it's a super easy reference when you want to look up the definition of a word. Say you'd like to find out what a clew is. You could search for define clew, and most of the search results would have some sort of definition. However, this is really just a normal keyword search with results that include long articles about clews or results that mention the definition in passing. To find a quick dictionary-style definition of a word, use the syntax DEFINE: before the term you want to define. The search in this case would be DEFINE: clew. The definition comes from a variety of dictionary-related websites, so there's a link to the full entry listed in search results as well. If your search term is misspelled, Google suggests an alternate search. 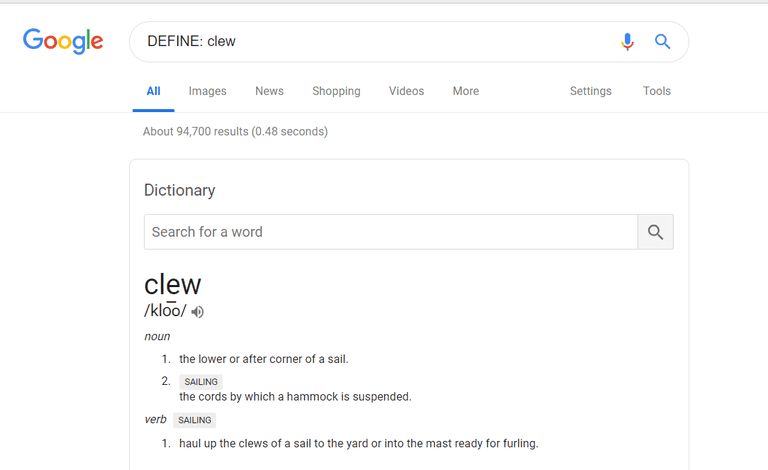 For example, type DEFINE: cliw and Google asks "Did you mean: DEFINE: clew." An alternative approach is typing the word you want defined, followed by the word definition. This works the same way, and returns the definition of the word in the same dictionary snippet format. Usually, you don't need to type the entire word "definition" before Google returns the definition in the search results. Select the speaker icon to hear how the word is pronounced. Select Translations, word origin, and more definitions to learn more about the word. Use the Search field to search for other dictionary words. The official Google dictionary extension is one of the most popular Chrome extensions. The reason it's so popular is because it's so easy to use. To find the definition of a word with the Google Definition Chrome Extension, highlight a word and select the Google Dictionary browser icon. Or, double-click any word on the web page to open a pop-up window that contains the definition of that word. Whether or not to display a pop-up definition on double-click. Whether to display a pop-up when one word is selected. Whether the extension stores every word you look up. If you love language and enjoy discovering new words, this extension is a great way to build your own personal library of interesting terms and definitions. What If You Want a Thesaurus? Google's dictionary only searches for definitions on the web. However, you'll find synonyms in searches with Google. Google also has a hidden calculator and a hidden phone book.